Yitta Schwartz, who died last month in New York at age 93, left behind some 2,000 living descendants. The Hawaii Health Department has to deal daily with birthers eager to see President Obama's "real" birth certificate, says spokeswoman Janice Okubo. When Okubo told one writer they did not have a right to Obama's birth certificate because they were not related to the president, the person wrote back saying they, indeed, had a common ancestor. Someday we might all be carrying bottles of liquid glass to the graveyard. 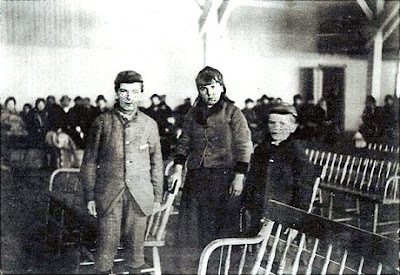 The latest chapter in the Annie Moore saga involves the discovery of a photograph that may or may not show Annie and her brothers at Ellis Island in 1892. Megan asks for help in proving the authenticity of the photo. My advice: check the back to see if their names are written there. Other than that ... I've got nothing. There might be a genetic reason that Uncle Mario prefers eating at the Szechuan Palace.